PRODUCT: 1-1/2" DIAMETER (38mm) HOT ROD XL BACKER ROD, CROSS-LINKED CLOSED CELL, FOR HOT POUR SEALANTS. 6 FEET/PIECE. 66 PIECES/CARTON (396 FEET). PRICE/CARTON. (UPS shipment only, special freight available on quantity purchases). Round, tan color, firm, resilient, polyethylene extruded closed celled foam with a water resistant outer skin. Cross Linked to provide high temperature and chemical resistance. Provides bond-breaker and controlled depth for sealants. Compresses up to 50% in smaller sizes and 30% in large sizes. Does not stick to sealants. Exceeds ASTM standards for bond breaking materials. No additional bond breaker is required. Very high moisture resistance. Will not absorb ground water. Compatible with all know types of sealants including butyl, polyurethane, silicones, tri-polymer, polysulfide, acrylic, etc. Select a backer-rod diameter that is approximately 25% larger than the width of the joint. 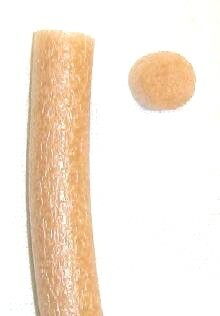 Backer Rod COMBO Insertion Tool Set (both for walls and corners). Set includes 640-6 and 640-5 Tool Sets. Includes wheels 1/8, 1/4, 3/8, 1/2 inch wide; tamping tool; regular 2-wheel insertion tool; corner insertion tool. Price/Set. Backer Rod Corner / Close Quarter Backer Rod Insertion Tool Set (for walls and small jobs). Set includes 4 insertion wheels: 1/8, 1/4, 3/8, 1/2 inch wide wheels. Price/Set. Backer Rod Insertion Tool Set for ROADS & TALL WALLS. Set includes 4 insertion wheels for 1/8, 1/4, 3/8, 1/2 wide wheels. Reinforced threaded end handle accepts (optional) threaded broom handle for stand-up use. PRICE/SET. Backer Rod STANDARD Insertion Tool Set (for Walls/Floors). Set includes 4 insertion wheels: 1/8, 1/4, 3/8 and 1/2 inch wide and a metal backer rod tamping tool. PRICE/SET.